Many art-museum directors arrive at new jobs with the strong desire to rehang the art in their new domains. So it was little surprise when, in September, the Worcester Art Museum unveiled "[remastered]," a fresh installation of its Old Master paintings developed largely by Matthias Waschek, who became the museum's director in November 2011, after eight years as director of the Pulitzer Foundation for the Arts in St. Louis. Mr. Waschek wasn't simply arranging the art to his taste, though. "[remastered]"—which hangs paintings in "medallion style" groupings, common in 17th- and 18th-century stately homes, that hinge on visual connections—is one of many changes he is making to reinvigorate the Worcester museum. It's a tall task. Worcester's attendance in the galleries in fiscal 2011 was a pitiful 31,435 (78,012 all told, including those who attend education sessions and events outside the galleries); the museum's donor base had shriveled along with the city's manufacturing sector; the museum, down to two curators, had little capacity to organize special exhibitions; staff was working four-day weeks to save money; and the museum's location, only 45 miles from Boston's bigger, richer Museum of Fine Arts, added to the challenge. But Mr. Waschek saw the potential of Worcester, whose collection is not only strong in European art but also includes splendid mosaics from the ancient Roman city of Antioch, a solid American-art collection, and samplings of other cultures. He was eager to try out his ideas for drawing more people to the museum. "I want people to fall in love with the art. When you fall in love, you think about something that is bigger than you are, bigger than your small world, bigger than what you are feeling at that moment—it goes to mankind." 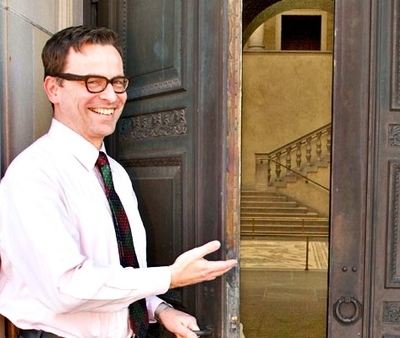 First, Mr. Waschek, a high-energy German who once headed the academic programs at the Louvre, had to get the public's attention—and he quickly found the right gesture. In a 2008 cost-cutting move, the museum had closed its front doors, which open onto the treasured mosaics, in favor of a side entrance. In June 2012, Mr. Waschek mounted a public campaign to raise the $60,000 needed for staff to reopen them (above); he got more than $100,000. To celebrate, he staged a ceremonial reopening, attended by state and local dignitaries, and waived the $14 admission fee for the rest of that summer. He also got lucky. Last March, the nearby deficit-ridden Higgins Armory Museum voted to close and hand over most of its collection, plus its nearly $3 million endowment, to the Worcester Art Museum. 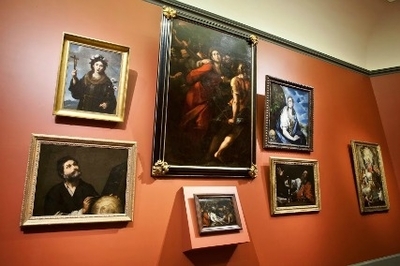 And in August, New York collector Hester Diamond donated Paolo Veronese's "Venus Disarming Cupid" (bottom left) in honor of her stepdaughter Rachel Kaminsky, an art dealer who joined the board as part of Mr. Waschek's campaign to broaden the museum's donor base. Meanwhile, to make room to hire four new curators—two are done deals—he trimmed staff, even as he convinced workers to return to a five-day work week without a pay increase. His most meaningful step so far is "[remastered]," which encourages museum-goers to linger in the galleries, looking for commonalities among the paintings in each assemblage. "I wanted it to be visceral, spiritual, inspiring," Mr. Waschek said. "Not the traditional hanging of one painting in a line, then one label; one painting, one label, repeated endlessly"—which too often results in people reading the labels, glancing at the art, and moving on. "[remastered]" offers no labels, though visitors can find the artist, title and date on cards in the galleries. As they were in centuries past, the paintings are tilted away from the wall for better viewing from below. The deep red and green galleries now hold 66 paintings, versus 57 works before, hung on neutral walls. One recent day, sitting across from a six-painting group arrayed around Giulio Cesare Procaccini's "The Betrayal of Christ" (early 17th century) and including paintings by Caravaggio, El Greco, Bartolomé Estebán Murillo, Jusepe de Ribera and Jan Lievens —to my mind, the most successful assemblage here (pictured, above right)—Mr. Waschek pointed out the fixed looks on the people in the paintings and the exchange of glances he set up among them. "It's all about the gaze," he said. In the next gallery, he had created a group around "The Calling of St. Matthew" (c. 1620) by Bernardo Strozzi. The four surrounding pictures share people in motion, gestures, lighting effects and patches of red. Another group, of two Dutch still-lifes, a church interior and a landscape, are connected by their use of white. Mr. Waschek also created dialogues between paintings hung many yards apart. For example, the center of one wall holds Gerrit van Honthorst's "A Smiling Young Man Squeezing Grapes" (1622) and exactly opposite him, two galleries away, hangs Nicolaes Maes's "An Old Woman Praying" (c. 1655): a face-off of both age and way of life. "All of this was serendipity," Mr. Waschek said, as the paintings were drawn from the museum's collection plus a few loans. "And gut." He readily acknowledges that what he sees in the groupings may not resonate with others—who in turn may see things he does not. To help visitors, the galleries contain unobtrusive seating, a rack for books on art history, religion and literature, and a few iPads, which provide information, a zoom function and a way for people to write their own labels or leave comments. The museum has scheduled programs in the galleries—drawing sessions, musical performances, storytime for families, and talks by clergy, community leaders and art historians. "We are measuring our success and making changes in response" to the public's reaction, Mr. Waschek said. "We will tweak it until we are sure that it can be adapted to the rest of the museum." People are complaining about the lack of labels, but he's not sure he'll bring them back. Aside from getting people to look longer, "[remastered]" begins to address a larger issue: Since the 19th century, museums have generally separated cultures, often placing their national art in a dominating position. "It was a political statement," Mr. Waschek said. "Look at the Louvre." Now, the world is global, and smaller museums can more easily experiment. "The big guys are locked in the 19th-century model, and we are not," he said. In "[remastered]," he mixed up Italian and Dutch paintings in the same groupings, and he says that when he gets to other parts of the museum, "The Hudson River school will go with Barbizon paintings. National schools are no longer relevant." Mr. Waschek is making headway on his pledge to push attendance to 200,000 by 2020. In the year to Aug. 31, visitors to the galleries totaled 53,493—a 70% increase in two years—and 89,155 overall. No two museums are alike, but if Mr. Waschek's experiment isn't being watched closely by other museums, it should be.